For nearly 50 years we have been dedicated to building innovative products designed to make on-farm storage and product handling easier and safer for our customers. Our vision has never changed: to deliver the most advanced and reliable grain handling products to farm. DE Engineers started from humble beginnings by Des Prater in 1965 which saw him provide fully welded square poultry feed bins and later the adaptation to round grain silos. 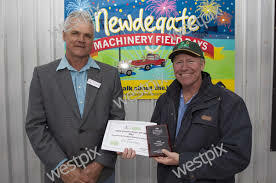 Today the company is one of WA’s largest farm machinery manufacturers with a workforce of between 35 and 50 full time staff and several product lines. Under the stewardship of Kevin Prater for the last 25 years the company has grown in products, service and even location with a purpose built silo manufacturing complex in Grass Valley being completed in 2010. This facility has brought additional employment opportunities to WA’s central regional hub. Now with two fully operational workshops DE Engineers productivity levels have risen to record levels and provided more space to work on new prototypes. Product development has been inspired by our customers and their requests, and as such it’s highly rewarding to be one of the most awarded agricultural manufacturers with ‘New Invention’ and ‘Innovation Award’s for a number of our products. The continuous assessment of our range of products keeps DE Engineers at the forefront of innovation every year.